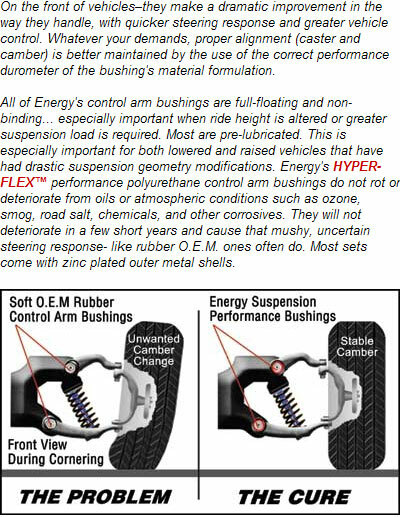 Control arms are triangular-shaped suspension components that connect a vehicle's wheel hubs to the chassis. The point of contact between the control arms and the chassis has a set of round rubber bushings that reduce vibration transference and prevent metal-on-metal contact between the arms and chassis. If the bushings incur water intrusion or other contamination, they can begin squeaking when you drive over bumps. During routine maintenance inspections, it's a good idea to inspect the control arm bushings for excessive signs of wear such as cracking, flaking or advanced deterioration, which can also bring undesirable noises. Climb under the vehicle with the silicone spray lubricant. Insert the spray straw into the lubricant's nozzle by hand. Insert the tip of the spray straw into the gap around the front lower control arm bushing and spray several quick bursts of lubricant. Repeat Step 2 on the rear lower control arm bushing, as well as the front and rear upper control arm bushings. Climb out from under the front end of the vehicle. Push down on the right front corner and quickly let go to bounce the right front end slightly and then again on the left front corner. This flexes the control arm unions, which works the lubricant deeper into the bushings. Repeat steps one through four if the bushings still squeak after road testing.